This Skillet Buttermilk Cornbread is soft, moist, and contains a buttery crust, perfect for munching on for breakfast or dinner! Growing up, one of my favorite things to do was to spend time with my Grandparents. They lived several blocks away from my childhood house, which made riding my bike to their house a necessity during the warmer months. They always left their back door unlocked, and I would eagerly fly in to see who was home. No matter what they were doing, my Grandma and Grandpa would always make time for me. We would sit at the kitchen table and talk, while nibbling on some of my Grandma’s baked goods or famous sandwiches. And when I would spend the night, I always looked forward to the breakfasts that my Grandma would make the following morning. And once in a while, my Grandma would make homemade cornbread to go along with breakfast. I always slathered it with honey and butter, and it was one of my favorite treats. To this day, I always think of my Grandma whenever I eat cornbread. While I can’t make it nearly as good as she did, I always love whipping up this tasty dish. This Skillet Buttermilk Cornbread is soft, moist, and contains a buttery crust, perfect for munching on during the cold winter months. So easy to make and even better to eat, this cornbread serves as a great breakfast or side to go along with a steaming bowl of chili (recipe coming next week) or soup. Because this Skillet Buttermilk Cornbread is made in a cast iron skillet, it takes on a buttery and crunchy crust. And like most of my recipes, this dish takes just minutes to whip up! Simply whisk together the dry ingredients in one bowl and the wet ingredients in another bowl. Pour the mixture into a butter cast iron skillet and bake until golden brown. One bite of this cornbread and you’ll never go back to the boxed mix again. This Skillet Buttermilk Cornbread bakes up moist and flavorful, a requirement for the perfect cornbread! And because I used buttermilk instead of regular milk, it lends added moisture so that the bread doesn’t turn out dry and crumbly. 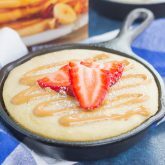 Perfect for breakfast, drizzled with some honey and butter, or served alongside your favorite dinner, this Skillet Buttermilk Cornbread is sure to be a winner in your house! This Skillet Buttermilk Cornbread is soft, moist, and contains a buttery crust, perfect for munching on for breakfast or dinner. Preheat oven to 425F. Place butter in a 9 inch cast iron skillet and place into oven until melted, then remove from oven. Set aside. In a medium bowl, whisk together cornmeal, flour, sugar, baking powder, baking soda, and salt. Set aside. In a large bowl, stir together the egg and buttermilk. Pour mixture into buttered skillet. Bake from 20-22 minutes, or until bread is golden brown and toothpick inserted in middle comes out clean. Let cool for 10 minutes in skillet before serving. Lightly adapted from The Food Network . That's so sweet about your grandparents. It's a real treasure to have that as a kid! And this looks absolutely delicious. It's awesome that you're continuing the legacy! Thank you, Mir! I have such great memories with my Grandparents. Love this story! I lived close to my grandparents too, and I could go there almost everyday. Realizing that a lot of people don't have that same luxury growing up makes treasure it even more and I feel very thankful. It was great to get to spend so much valuable time with them. Especially when cornbread was involved! I agree, Liz! A lot of people I know hardly ever saw their grandparents or they weren't close with them. I'm so lucky I had the chance to spend so much time with them! Wow, that must be so neat to be living in your Grandparents' house, Laura! I'm sure you have a lot of treasured memories! This is such a sweet story! I never got to know any of my grandparents, so it sounds so awesome that you got to live so close and pop over whenever you wanted! Also... now I am craving cornbread!!! Thanks, Sues! Cornbread is perfect for this time of year! Love this post, Gayle! Your story is as cozy and comforting as your cornbread! Wow, this looks delicious!! Have a great weekend! Thank you, Annie! Hope you have a wonderful weekend, too! What a sweet story about your grandparents. It reminds me of spending time with my grandmother. She is such a wonderful cook, and throughout the years I've asked for her recipes but can never quite get things to taste like when she makes them! I'm sure your cornbread is delicious, though. It's mouth-watering from here! I'm the same way, Sarah! I could make the exact same thing as my Grandma, but I can guarantee that it wouldn't taste quite the same. Thanks for the kind words! Thank you, Medha! This was my first time making cornbread in a skillet, and I have to say that I'm hooked! I love your thinking, Jen! I definitely think it's the extra love and comfort that goes into a Grandma's recipe that makes it taste extra special. Have a wonderful weekend, too! WOW, these photos are stunning! I want a big piece of this cornbread! What fun memories with your grandparents! I never lived close to either set of grandparents, but I wished that I had! This cornbread looks amazing! Definitely, Kelly! Some of my favorite foods stem from my Grandma. Thanks for the cornbread love, friend! Thanks for the sweet compliments and pin, Mira! Hope you have a great weekend! That is so special that you got to live so close to your grandparents and spend so much time with them growing up. The connection between food and memories is one of the strongest, isn't it? 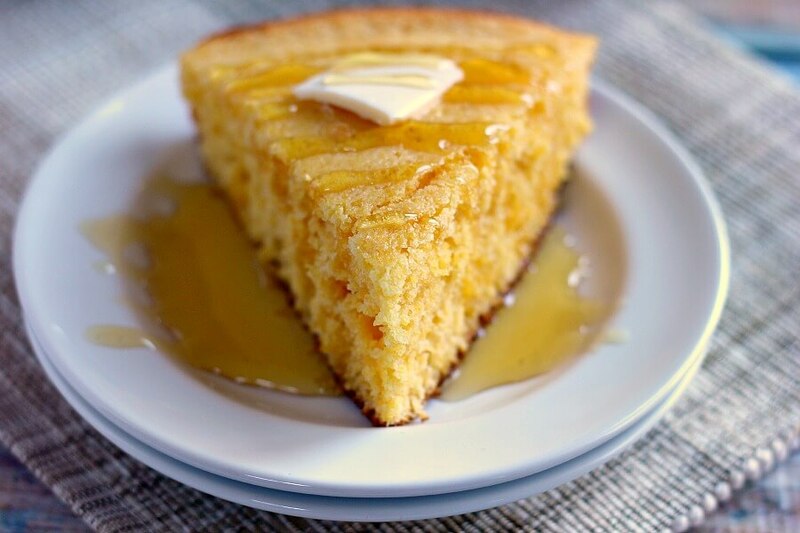 I could totally go for a slice of this cornbread right now. Your photos are gorgeous - I love the lighting in them! I'm so thankful that I was able to share such wonderful memories with them growing up. Thanks so much for the kind words, Kristine! I just love this story Gayle. How lucky that your grandparents lived right near your house. I would have loved to live closer to my grandparents. And don't grandmas make the best food? It must be all the love. I love a good cornbread, especially smothered in honey and butter. Happy Friday friend! My Grandma made the best food ever, Natalie! I could never even come close! :) Happy Friday to you, too! I love trying different cornbread recipes - can't wait to try this one! I looks so fluffy and perfect! I actually haven't made cornbread in a while, going to have to make this one soon! This was my first time making a buttermilk cornbread, and I have to say that it's my favorite way to make it! It turned out so soft and fluffy! I always loved cooking and baking with my grandma! This cornbread looks perfect -- I'm sure it's just as good as hers! Oh I love love LOVE corn bread!! This looks so good!! ...and healthy and delicious and yummy!! For the win! ...and you used honey?? So good! Great recipe girl! Thanks, Cailee! 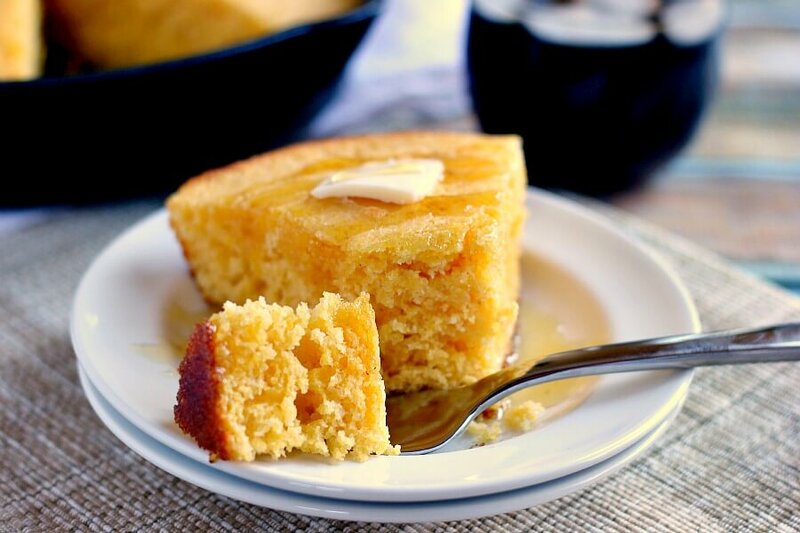 Honey and cornbread are the perfect pair! Gayle what a sweet post. I used to spend weeks at a time at my grandparents too. Now my kids do. :) I have to say I love cornbread. It is my fav, but I have never made it on a cast iron skillet because I never had one until a week ago. I am so making this recipe with some chili this week. Now I am excited. Thank you! Pinned! Have a wonderful weekend friend! That's so great that your kids get to follow in your footsteps, Cyndi! And that's so exciting taht you got a cast iron skillet. I think you will love it! Thanks for the cornbread love and pin, friend! Hope you have a wonderful weekend, too! Gayle.. what a delicious recipe and awesome post! I'm die-hard fan of skillet cornbread ad your pictures making me hungry! You know, growing up my grandparents too lived just a street away and I have vivid memories of spending my whole day in their house...pinning the recipe! thanks for sharing! Thanks for the sweet compliments and pin, Savita! Have a great weekend! Man, I love cornbread! This definitely seems like something my grandma would whip up. Yum! I grew up spending many afternoons and summers with my grandparents and have great memories of the time they spent with us! I feel very fortunate that they're still here and in good health to see their soon-to-be great-grandchild. Crazy! That's so great, Meg! I'm sure it will be so special for your grandparents to meet your child! Have a wonderful weekend! Chili and cornbread are the perfect pair! Thanks, Linda! that's such a sweet story Gayle...grandparents are always special and they really whip up the most delicious treats! The cornbread looks lovely, perfect for this weather! I love that you loved spending time with your grandparents. How nice that you lived so close to them as a child! Also, happy birthday to Pumpkin n' Spice! (: I love love love cornbread. I was planning on making some to go with a pot of chili, and I will definitely try your recipe!! Thanks, Connie! This is so perfect to go with some chili. I hope you love it if you try it! I lived close by my grandparents house and visited them all the time too. It's fun to remember times like that. 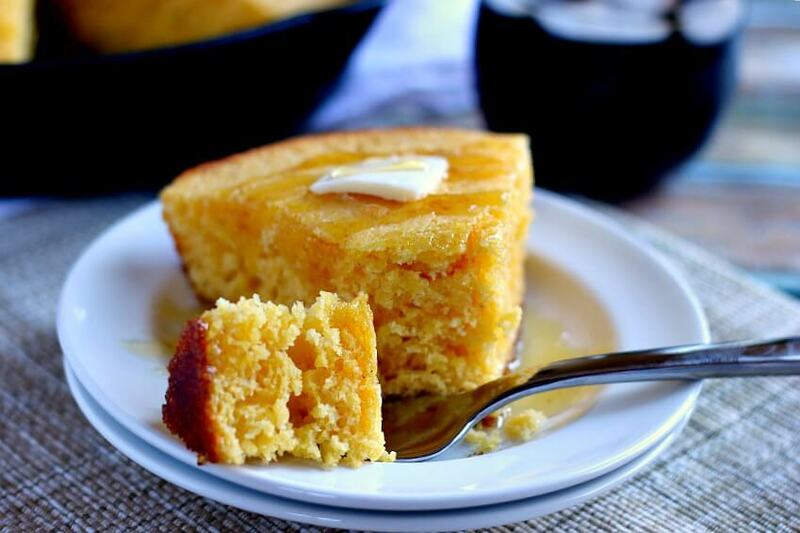 I'm absolutely loving this cornbread and it would go perfect with a nice bowl of chili. I need to make this soon! I have such great memories with my Grandparents! Thanks for the kind words, Danielle! Thanks for the kind words and for stopping by, Susan! That's so sweet, Gayle! Your grandparents sound lovely! I know what that's like, I was very close to mine too! I love a good cornbread recipe, and your timing is impeccable since I just bought my first (two actually!) skillet yesterday!!! Can't wait to try this! Congrats on getting your first skillet, Sarah! You're going to love it! Have a great weekend! Such sweet memories, Gayle! While I didn't live close to my grandparents, I have so many memories of chatting and visiting over baked goods. Specifically jelly sticks from Dunkin Donuts. :) I am allllll about cornbread, but for some reason have never made it in a skillet. This is perfect! Sounds like you shared a special bond with your grandparents, Alyssa! Thanks for the cornbread love! I really wish I could turn back time once in a while and relive those days, Marcie! Thanks so much for the kind words and pin! Thanks so much for the cornbread love and pin, Michelle! It must have been so idyllic having your grandparents right down the street when you were little! This cornbread looks amazing. I love the crispy edges! Mmm I love cornbread, and love that you made this in a skillet! Looks delicious, Gayle, and I'll definitely have to try putting honey on my cornbread, sounds amazing! Thanks, Denise! Honey is the best on cornbread! Thank you, Renee! That's so nice that your kids are close with your mom. I'm sure they love that, too! I can eat cornbread like it's a job. This looks fantastic! I always make the mistake of reading your blog when it is late at night and I'm hungry and I want everything on here! 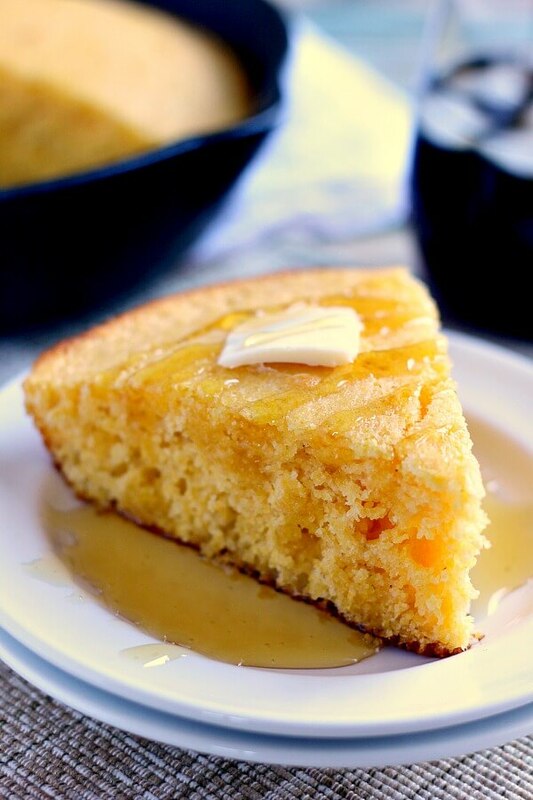 I haven't made cornbread in so long, but this looks delicious and I want some right now! What a great childhood memory, Gayle! I remember always look forward to my grandma's breakfasts growing up as well! She'd always make me peanut butter - maple syrup eggo sandwiches which were all kinds of amazing :) This cornbread looks PERFECT and so soft. I love the idea of eating it with honey as well :) Pinned! Hope your week is off to a great start! Yum, those peanut butter egg sandwiches sound delicious, Ceara! Thanks for the cornbread love! Honey is so delicious with it. Hope you have a wonderful Monday! Grandmas definitely make the best food! Thanks for the cornbread love, Sarah! Happy blog birthday and I LOVE this cornbread!!! I could seriously eat cornbread everyday .. smothered in butter and honey. . yummmm!!! love! Sounds like this is the perfect recipe for you, Andrea! I hope you love it if you try it! And thanks for the pin! Hi Jeannie! I'm so glad you liked the corn bread. I will have a similar recipe that I'm sharing next week, so I think you'll like that, too! Thanks so much for stopping by! Always nice to try your recipes Gayle. I have yet to try this cornbread recipe of yours (nice story of the origins by the way!). I have been using the below recipe and the result is a bit disappointing. In the end instead of a soft, tender and moist result, I get something that is dry and hard. http://www.food.com/recipe/cornbread-dairy-free-104814 I am ok with dairy products but I don't like eggs so I will try to get an egg replacer substitute when using your recipe. Comparing the recipe from food.com and your recipe, I note that your recipe has eggs and buttermilk. 1. 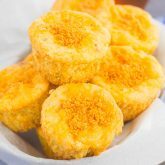 Is it correct to say that the key ingredients for a soft and tender cornbread (similar to the tenderness and softness of cake) are eggs and buttermilk? 2. 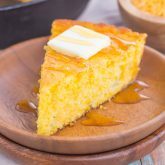 Which of the two (eggs or buttermilk) contribute more to a soft and tender (cake-like) result for cornbread? 3. Any tips for a great egg replacer or egg substitute? If yes, please advise what quantity etc. should I use in your lovely recipe above. Thanks!!!! Hi Ris! Thank you for stopping by. I'm so glad you are enjoying my recipes! I think that buttermilk definitely helps with a softer texture in cornbread. I have never made it without eggs or buttermilk, so I can't say for sure what it would be like without those ingredients. Unfortunately, I do not know any good egg substitutes, as I always use eggs when called for in recipes. 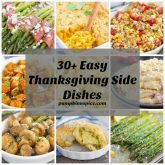 However, I did find this link which may be helpful for you; http://www.thekitchn.com/5-vegan-substitutes-for-eggs-in-baking-tips-from-the-kitchn-136591 I hope you enjoy and thank you so much for reading! Have a great day! Thanks for your reply Gayle, which is understandable. Thanks for the link too. What if one makes cornbread using a standard recipe (e.g. with a 50/50 ratio - i.e. e.g. 1 cup cornmeal and 1 cup all purpose flour etc...) and the final result tastes more like a regular sponge cake in terms of flavor (but has the texture of cornbread), how can one get the cornbread tasting more like real cornbread in terms of the cornmeal flavor? Naturally one would add more cornmeal to the recipe, but if more cornmeal is added, what ingredient(s) would generally necessarily need to be increased as well to accommodate the increased cornmeal? Hi Ris! Unfortunately, I've only made the recipe as I've written it in the instructions, so I can't speak to the flour or cornmeal ratio and how different adjustments might turn out. Thanks! Maybe my skillet was small, but I followed the menu and just made a batch which was enough for an iron skillet, mini loaf pan and mini corning ware skillet. It was delicious!! I cut them up to put in the freezer so when I needed some cornbread, I would have it. Thanks for sharing. I will definitely be making more for the holidays. Thanks so much for the kind words! I am so glad that you liked this cornbread. That is such a great idea to freeze it, too. Thanks for stopping by! what size cast iron skillet did you use? Also, did you use salted or unsalted butter? Can't wait to try this recipe! Hi Diane! I used a 9 inch cast iron skillet and unsalted butter. I also updated the recipe directions to show that, so thanks for pointing that out. I hope you love this if you try it!